"13" is our 1-3-1 half court trap. Can be very effective when you have teams with good wing span. This defense gives you good opportunities to trap near half court and on the baseline. The key to the "13" is the rotation of the two wings X4 and x2. They must protect the basket when they are on the weak side. 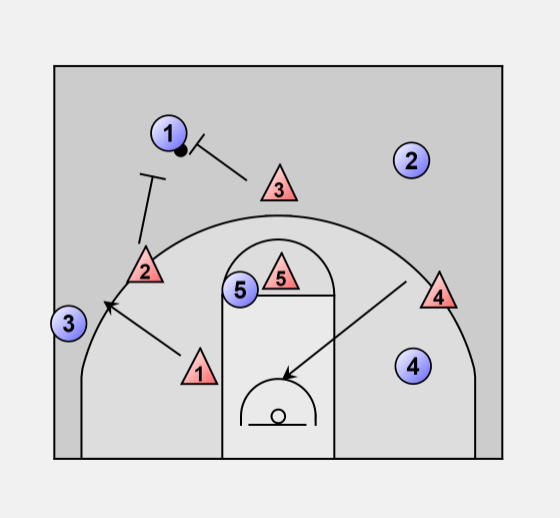 x1 will start on the ball side block, and run the baseline if the ball is reversed. Here the ball is reversed. x3 sprint over to trap with x4. 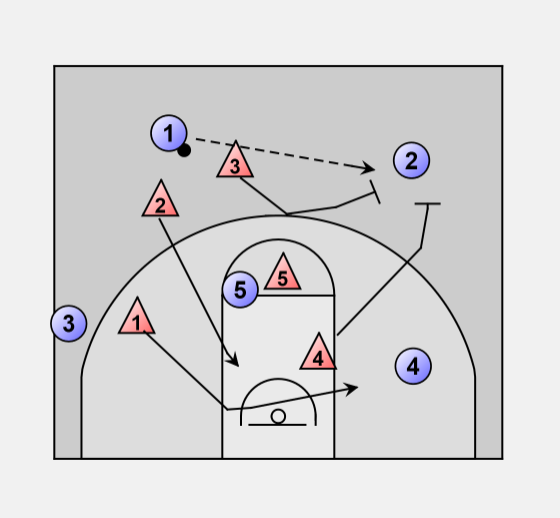 x1 runs the baseline and x2 rotates back to protect the basket. x5 matches up with anyone in the middle. We will use "13" out of timeouts to give the opponent a different look or if we want a quick trap. We usually do not use the "13" for extended periods of time.